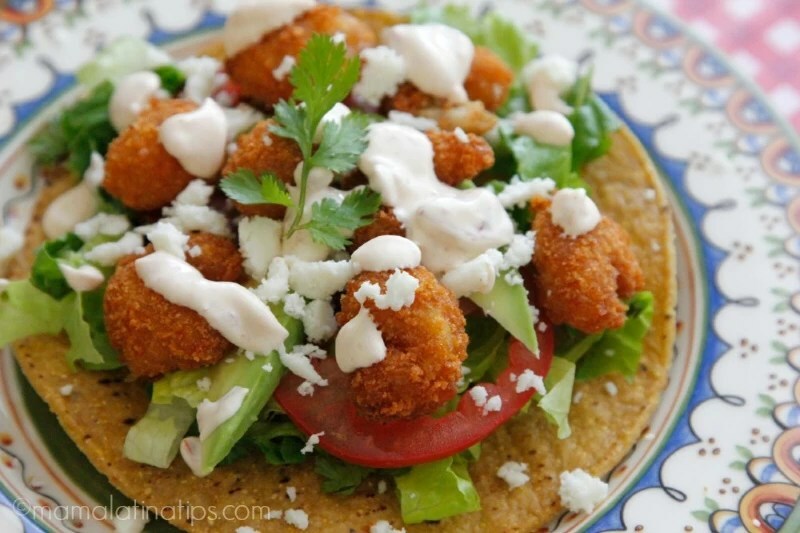 These popcorn shrimp tostadas with chipotle cream are simple to make, crunchy and delicious. A favorite in our household. Try them out! Thank you to the National Frozen & Refrigerated Foods Association (NFRA) for making this shrimp tostadas with chipotle cream possible. All comments, opinions and my love for exploring new cultures, spices and flavor combinations are my own! Lately, my husband and I keep mentioning to each other how much we enjoy seafood. It’s very versatile, isn’t it? It can be served in so many ways, is quick and easy, and the kids love it, which is a huge plus. So it’s no surprise that we serve up a lot of it, and, come to think of it, it’s time to restock the freezer because we always like to have plenty handy for fast, convenient, and nutritious meals. This recipe for shrimp tostadas is incredibly simple, but still so extraordinarily satisfying and delicious. I just had to share it with you. I love how the cool sour cream balances out the kick from the chipotles and I enjoy the crunch of the shrimp and tostadas together, which are brought to perfection with just a hint of salt and lemon. Of course, it doesn’t hurt that the only thing I have to do is heat up the shrimp in the oven, which makes this recipe incredibly convenient for me…and you. The whole dish is like an easy-to-make treat that’s still high in protein and made with real, quality ingredients. Enjoy! Bake Gorton’s® Popcorn Shrimp (or butterfly shrimp) following the instructions on the package. While shrimp is cooking, prepare the chipotle cream. Mix Daisy® sour cream with chipotles using a spoon until the peppers are completely broken down, the cream will become a pale shade of pink. Add mayonnaise, lemon juice, and salt to taste. Mix well. Refrigerate. Chop cilantro and add to the chopped lettuce. Peel and slice avocados just after you take the shrimp out of the oven. 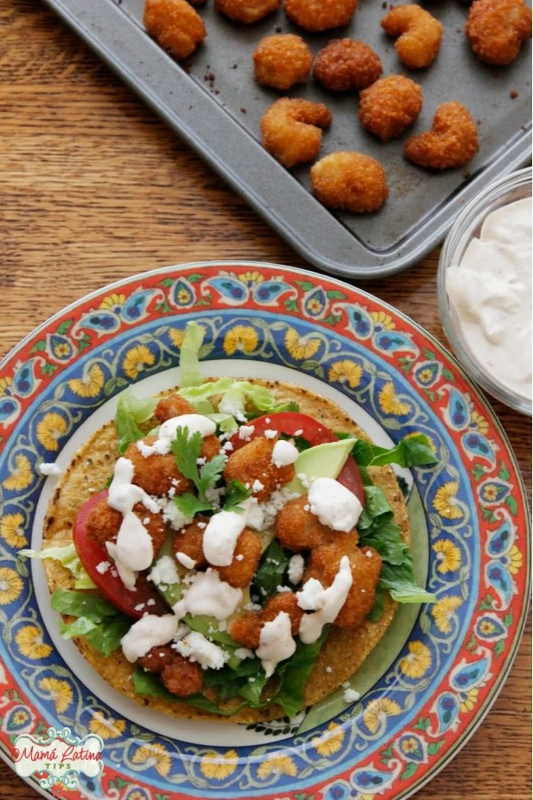 Take a tostada, add a layer of lettuce, then add tomatoes, avocado, top with the shrimp and finish with the crumbled queso fresco and chipotle cream. For more meal inspiration, check out the NFRA over at www.EasyHomeMeals.com, and our “Cool Food Panel” board on Pinterest here. Yummy! Que ricas se ven, tengo que probarlas! Que receta tan exquisita. Tengo que hacerlas y te cuento como me fue! Saludos! Love the combination of flavors, colors and textures in this recipe. Thanks for sharing Silvia! Those look so good and I can imagine using that sour cream on just about anything! Very impressive tostadas, so delicious. Thank you! Also, they are so pretty to look at.